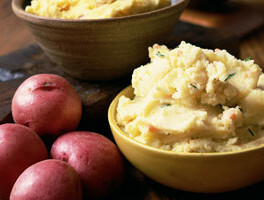 Leaving the skin on the potatoes increases the fiber in this recipe. By mixing the cauliflower with potatoes, you get the same volume for less carbs! Add potatoes to a large soup pot. Cover with cold water and bring to a boil. Cook for 15 minutes. Add cauliflower to pot, return to a boil, and cook for 5 more minutes. Drain potatoes and cauliflower and return to pot. Add remaining ingredients and mash mixture with a potato masher. Mix with an electric mixer on low-speed for about 1 minute.